Look! An iPhone app! These sure are rare! How about bellying up to the bar without actually having to move your belly, thus allowing said belly to grow? myOrder can help with that. myOrder is an iPhone app that allows you to order from inside your favorite bar/restaurant/snack shack. The application uses the iPhone's faux-GPS to locate you, then you punch in your order, and voila! Your order arrives without you having to stand four people deep and pray for a bartender's attention. If you're a hot girl, this is not a problem for you. If you're me, you don't drink much. There's only a limited amount of places that you can use it right now, like San Francisco and your house. Except when your significant other gets the order at your house it's called a "text message" and you better damn well remember that you owe them one. You can pick up myOrder in the app store on iTunes. 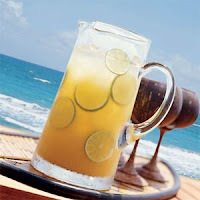 With the BIGGEST MEMORIAL DAY EVER on its way this coming weekend, I'd be remiss if I didn't get you some recipes well in advance so you can prepare to serve up the most rockin' punch that will keep your guests drunk and sunburned! Fine Living Network has put together some options for a tasty weekend including a ginger passion punch, a sangria, a watermelon champagne punch, and lots more. There's even a punch to make if you're drinking alone and want to pretend that you're popular enough to have to make a punch for all your "friends." When five stars wasn't enough for some hotels, they invented the six star designation in order to separate themselves from the ghetto five star hotels. They wanted you to know that not only could you get your shirt laundered overnight but they would also put it on for you and take your place at the boring convention you were in town for. "Signature Premium" means that the alcohol within the bottle is very high-end but it also has features that allow it to rise above mere "Premium" designation. 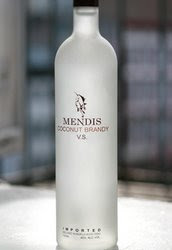 In the case of Mendis Coconut Brandy means that the alcohol will have a short run, artistic expression, and signature markings on the bottle. The bottle not only has the Mendis and Luma names on it but it also comes with a pair of ML cufflinks adorned with Cognac-colored diamonds set in 18 carat white gold. The cufflinks let the whole world know that you dress like you drink. You can see a video of the cufflinks, swirling about and hypnotizing you, right here. This has to be the most contradictory press release I've ever received, which means I absolutely had to talk about it. I got the note about a new game that is launching with a national "Stay At Home Tonight" campaign. The campaign is against, of course, drunken driving, but also against, get this, binge drinking. Here's where it gets fun, because Pukes and Staggers says that they "will have you laughing and drinking beyond imagination!" The game asks, "Have you ever tried to drink a beer upside-down, reveal an embarrassing story about yourself, or mix together every drink in the room?" Well, yes, most people have. It's called "Saturday Night." I'm not sure if this is the most brilliant tie-in to a random press release ever or such an unbelievable crock that I might have to tell Louis Black. 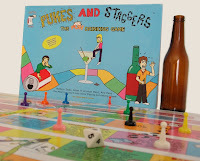 Drinking games can be a lot of fun but if you need a board game to figure out how to drink, you've already lost. If you don't know what Twitter is it's....hahaah! That was funny. I almost believed you! Ever get the hankering for a lotto ticket, a ThirstBuster, a cheesy taquito, and a nice Cabernet Savignon for later? 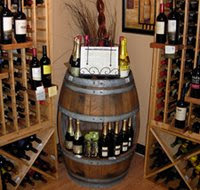 Circle K has decided to get your well-rounded back by opening up a 100 square foot wine cellar in one of their stores in Costa Mesa, CA. If it's successful (and why wouldn't it be?) then they expect to open more of them throughout their West Coast operations. Sorry East Coast, I guess this means we really do have more class than you. Wine prices range from US$5.99 to $90 and have multiple varietals. More stores are possible but not all of them have the 100 square feet of prime cheesy taquito space to give up for the cellar, so it will be on a limited basis. I have a bottle of this and probability is that you don't. I'm sad for you. Let's talk about it just like some guy who just came back from The Bahamas in the middle of winter telling you every single detail about his days on the beach. 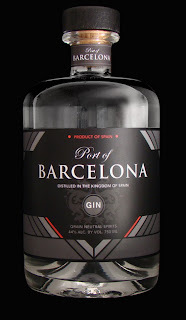 Port of Barcelona is a small batch gin made by Esmeralda Distillery, the same geniuses who brought you Obsello Absinthe. The gin starts with malted barley and goes on to triple distillation and infused with Wild Juniper, Iris Flower Root, Star Anise, Coriander Seeds, Orange Peels, Sweet Almonds, Hazelnuts, Lemon Zest, Chebub Seeds, Black Cardamom, Orris Root, Ginger Root, Nutmeg, Cubeb Root. That's quite a mouthful. Let's fill our mouth with it. Food & Wine magazine has just launched their list of the Top 100 bars in America. Surprisingly, the list is actually GOOD. Some of the bars are fairly obvious (Tini Bigs, The Drawing Room, Absinthe) but others are a great addition. I'm glad to state that I've been to all the ones in San Francisco and I'm even a regular at ones like Nopa, Beretta, and Bourbon & Branch. Clyde Commons in Portland is a great spot and Morgenthaler is running it now (no pressure, Jeffrey). B Flat and Milk & Honey in NYC are absolute must-visits.